Saver box is a dubious application that has been spreading around the web lately. Reports show that quite a few users had their operating system infected by this adware. It is possible that some users were mislead by the dubious marketing slogans made by the publishers. The application is here to help you shop online without hurting your budget. Well, that sounds very tempting. You should not get fooled by that as Saver box will in no way help you save money. The only thing that applications like Saver box are good at is disrupting your browsing experience and exposing you to various internet-based infections. You have to remove Saver box as it is the only way to go if you wish to maintain a clean and smoothly performing system. 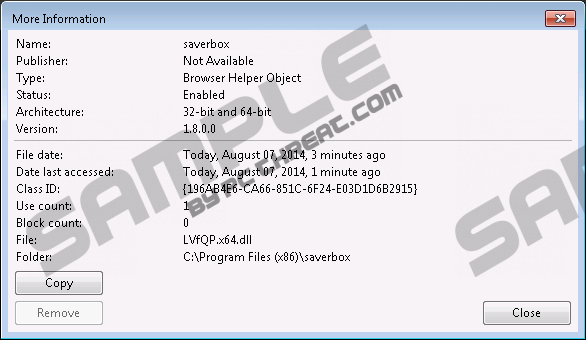 Based on JustplugIt engine, Saver box works in a very similar ways as other adware applications (PeakCoupon, RealDeal, FlashCoupon, PriceChop, etc.) based on this particular engine. It installs browser extensions after successfully gaining access to your operating system. All popular browsers (Mozilla Firefox, Internet Explorer, and Google Chrome) are affected by this adware program. The extensions are interacting with various adware servers to display various third-party commercial adverts while you browse the web whether you like it or not. Since adware servers are generally associated with various malware, it is safe to assume that you might be presented with an ad that contains a redirect link. You might be redirect to a website filled with even more useless commercial adverts, or worse – a corrupted or fake website. Often fake websites mimic online stores, these are setup by cybercriminals to steal your sensitive data. You might land on a website containing extremely tempting offers. In most cases, these websites mimic the design of a well-known online retailer. That is why unsuspecting users might fall prey. Always check the legitimacy of unknown online stores, or stores that seem unreliable to you. Beware of any dubious download websites as these provide bundled software, and that is the main method of Saver box distribution. Users that are keen on trying new software are often downloading it from various dubious websites instead of the official one. Avoid such websites as much as possible because most of the distributed installers are filled with potentially unwanted or even potentially dangerous applications. You have to remove Saver box without hesitation. Use the provided guide but be very cautious as only one incorrectly executed step could mean that the infection was not removed entirely. Such leftovers are known to be the cause of Saver box restoring itself automatically. That is why we provide a detailed list of files, folders, and registry entries associated to this particular adware. Use it as a guide while rechecking your system for potential leftovers. Then select Settings in the Charm bar. Select Saver box and click Uninstall. Locate Saver box and then double-click it to remove it. Then select and remove Saver box. Quick & tested solution for Saver box removal.